Get the season's rage with stunning Kas quilt covers. Your room is your style articulation and it needs to look superior to anything. Our brilliant gathering of Kas bedcover spread sets has made it less demanding for everybody to relate their bedding with their identity. Kas bedding reach incorporates the most quality bed cloth that is unmatchable in both outline and quality. Skim through our appealing Kas quilt covers sets range and; supplement the look with coordinating Kas pads, Kas sheets and Kas tosses. 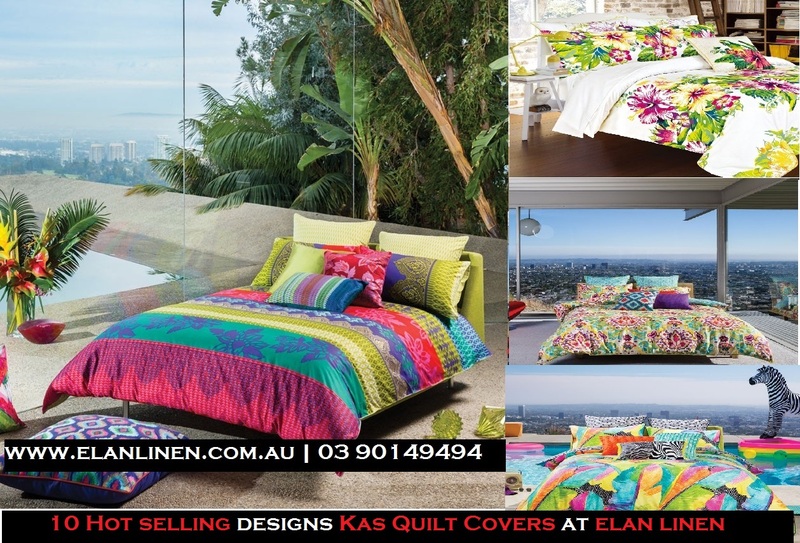 Below are the 10 best selling designs of quilt covers by KAS 2015. They are ranked according to their sale at Elan Linen. A lovely 100% cotton quilt cover set. This quilted quilt has fitted corners to maximise bedroom space, and cushions attached enhances the beauty of the quilt. Cleo Quilt Cover Set by Kas features a vibrant design combine’s tribal with trance geometrics and luxe Art Deco opulence. Cleo Quilt Cover Set is printed on 300 TC cotton sateen & this quilt set has a luxurious hand feel that is sure to please your mood. Complete the look with matching european pillowcases, cushions, & throws. Indulge yourself in the Tribal trance of Bermuda quilt cover set by Kas. Printed on 300TC cotton Sateen with piping detail & stripes printed reverse, this tribal inspired design is a bold blend of structure and colour that will add life to any bedroom makeover. Shop the complete Bermuda range below & get the look with complementing cushions & euros. Emery Quilt Cover Set by Kas is a fresh and colourful design. This painterly, impressionist design features blushy, romantic hues. A soft and calming quilt cover set with a subtle monotone printed reverse. Emery Quilt Cover Set by Kas is Printed on 300TC cotton sateen..
Get into the groove with the Moko quilt cover set by KAS Room range. The nature inspired pattern is printed onto a luxurious linen cotton blend, with a cotton percale reverse. Don’t miss out on the matching european pillowcases. Broken Stripes is a strong statement piece, this hand painted linear brush print brings a clean liveable look to your bedroom. Broken Stripes quilt cover features Front: linen/cotton mix. Reverse: 100% cotton percale, 250 thread count. Trapeze quilt cover set from KAS LAB EDITION is simply a cluster of complex puzzles and geometric shapes in different colors. Featuring red, pink, aqua, yellow and electric blue hues, the quilt cover creates your own bedroom statement that is definitely unique. Complete the look with matching european pillowcases and kas cushions. Trapeze quit cover is 300 TC printed on cotton sateen, contrast piping detail. Inject the beauty of colors & freshness of spring in your bedroom with Nyah Quilt Cover Set by Kas. Featuring beautiful floral theme in purple, yellow & teal combination on a 300 TC cotton sateen fabric, Nyah Bedding set will brighten up your room's decor. Add on matching cushions & euros to complete the look. This gorgeous floral design is vibrant and refreshing. It features a floral design with bold flowers and leaves in rich hues of purple and green to give a pleasant look to the room décor. Rome around the sari indian markets with our Siesta quilt cover set by Kas. Printed on a cotton dobby with 300 thread count & piping detail, featuring hues of chartreuse, pink & blue, siesta quilt cover is fully assembled and ready to use. The reverse of quilt cover has a printed cotton percale.